These helpful layer mask tips will help to streamline your digital art workflow. As any beginner Photoshop tutorial will tell you, layer masks are one of the most fundamental parts of the software. Without them your work is sure to look flat. 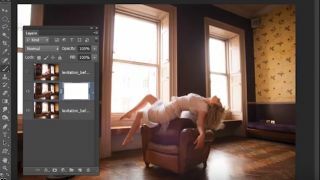 To help you work more quickly and easily with layer masks, we've put together this list of seven tips and shortcuts. While painting on masks with the Brush Tool, press D to set colours to black and white; black hides, white reveals. Press X to flip between the two. Alt-click the Add Mask icon in the Layers Panel for a black mask that completely hides the layer (or highlight a white mask thumbnail and press Cmd/Ctrl+I to invert it to black). You can Alt-click a layer mask thumbnail to toggle a view on or off that shows the layer mask instead of the image. When you’re painting in white or black on a mask, try setting the Brush Blend Mode to Overlay. This enables you to gently tidy up any messy edges you come across. Hold Alt and drag a layer mask thumbnail from one layer to another to copy it over, or Cmd/Ctrl click the thumbnail to load a selection . Right-click a mask thumbnail and choose Refine Mask to access a near-identical set of controls to Refine Edge, which let you improve the mask. Click the little link between layer and mask thumbnails in the Layers Panel to toggle it off. This lets you move the layer contents or mask independently of one another. This article was originally published in Practical Photoshop; subscribe here.